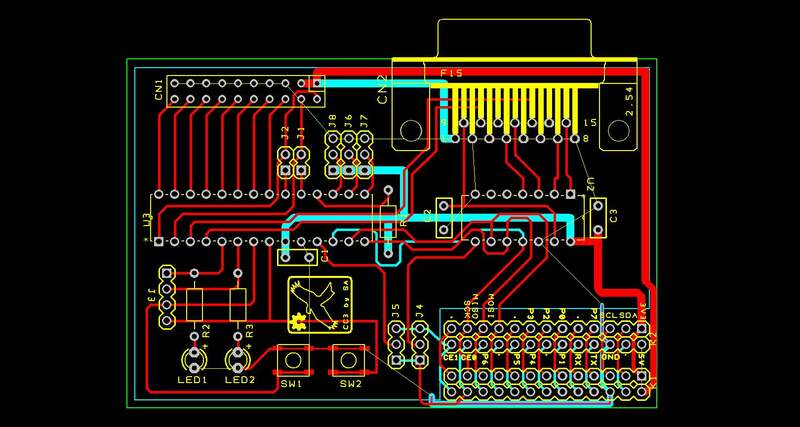 This entry was posted on Wednesday, March 14th, 2012 at 1:49 pm and is filed under Electronics, PCB, Raspberry PI, Vintage Computer. You can follow any responses to this entry through the RSS 2.0 feed. You can leave a response, or trackback from your own site. Nice. Are you planning to manufacture any of these? I’m after a general purpose IO board, with GPS. I was thinking of using one of these http://www.usglobalsat.com/store/download/57/br355_ds_ug.pdf as they are cheap, and easily connected to the UART via a max232. It would provide time/date as well as location for Sat Nav, datalogging, and/or tracking. I probably will get some made if there is enough interest. I’ve not seen that particular make of GPS but it should be easy to interface with the RPi. Why use an external on it ? There are plenty of external USB GPS devices out there or use Zuzebox’s RS232 breakout with a GPS module and an external antenna. I did look at USB GPS, but the Pi has only 1 or 2 USB sockets. Just trying to avoid having to use a hub. An Integrated GPS has one problem. You either need to provide an external antenna, or your limited to the Pi’s placement in the vehicle. I figure a lot of people are going to want to use the Pi in the car. I figure an expansion board for that purpose would be a very popular. There is plenty of Linux software out there that could make use of that. SatNav. CAN bus diagnostics, GPS Tracking, music/video player. I’d be willing to put some cash up for a run of PCBs. Of course this makes it hardware compatible on the plug and socket level. Are you thinking of a driver that will take in the software commands from the old machine. I know the Pi will be able to run RISCOS, it might be worth reviving some of my old projects for it. It seems to be an EAGLE project. Is it possible to get the board file? No sorry this isn’t a EagleCAD project. I used DesignSpark PCB to design the PCB’s. I can send you the DSPCB files if you want. The cost of the ADC either the MCP3004 10-bit or MCP3204 12-bit is the main component cost. Which would you prefer 10-bit ADC or 12-bit ADC? I have a suspended project which collected analogue data on the BBC micro and I would like to resurrect it, so would be interested in a board – if the price is right. That would be cool. I’ve not any boards just yet but planning on get some made soon. I would be very interested in one too. unpopulated would be fine, even just the DesignSpark file would be good. Is there RISC OS support yet OSBYTE 16,17,128,188,189,150,151 for ADVAL in BASIC etc. I’ve been working on the MiniPiio boards lately but I’m planning on coming back to UserPort soon. This is a great baseline for what I wanted to create and was hoping you’d share the schematic. I’m new to DesignSpark, but have some eCAD experience and I need to develop a GPIO board with (16) digital, 12-VDC opto-isolated “fast” switch reed inputs over some long lengths. Protecting the RPI is a concern, as well as supplying all the voltages needed for 3.3, 5 and 12v from a wide-range AC adapter. Are you comfortable sharing what you are working on now and the source files for the BBC I/O Board? Larry@BSI – Developers of Airhorn! Do you have a library that would let me talk to a MCP3204 via the SPI port on the PI? I have one and can’t find any example source. Want to turn it in to a blog post later on. I am interested in buying it, What is the protocol …Please guide me through.